Anyone as obsessed as I am with food will tell you, eating is not just about survival. They/you/we are in an extremely fortunate, and small, percentile of people who gets to think about food as a means of pleasure. I appreciate and seek out good food, but also good food experiences. I like the entire experience of eating, including the aesthetics. 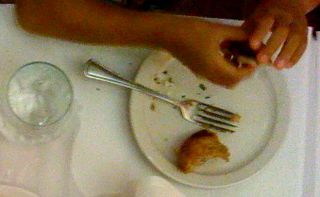 And even more than that, I revel in where and how I’m eating, whether dining alone, silently, or with with others. I see the entire experience of eating as sacred. That’s both why I never really stray far from what I promise to bring to you on this site: original recipes, delicious meals and stories about food, and why I am talking about a famine today. I despise the paradox surrounding eating: the absolute necessity and the unfortunately reality that it’s a privilege. We need air, water and food and the fact that at least 2 out of the 3 is out of reach for so many people is an everyday horror as close as the people I walk by on the way to anywhere, who ask specifically for money for food, and as far away as the current famine in Somalia, Ethiopia and Kenya. In the early 1990s, 300,000 people died during the famine in Somalia. I just read that almost 30,000 children under the age of 5 have died in the last 90 days. The desperate situation Somalis are in today is forcing hundreds of thousands of people to flee and tragically, they, especially the woman, are walking toward different perils. I have made some donations (a reminder, the Canadian government is currently matching them, as are some employers) but I have no idea if a real solution is being worked on. I have no plea and no recommendation. Beyond a drought, there is a conflict, politics and other complications at the root of this crisis but regardless of why, what we have today are mass numbers of us desperate and dying and it can’t be ignored. I don’t know what to do except to not ignore it and to be increasingly aware of similar impending situations and possible solutions. And, for what it’s worth (which, even more than anything else I’ve said would be open to debate) to live with increasing concern and gratitude. Hi! I love reading this article. Seriously, I also agree with you. Eating is sacred, and I always take my time unlike other people. I also tell my friends how do I eat and I really hate people who are messy when they’re eating. Great piece. The state of food in the world today is just astonishingly sad, in all regards, from excess to famine. Great link to solutions.